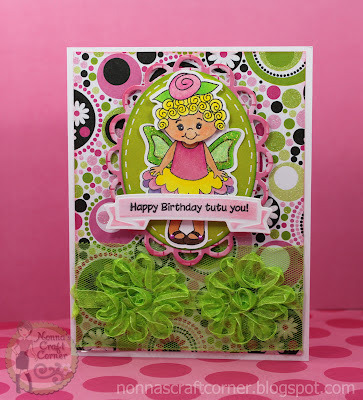 Studio 5380: Happy Birthday tutu you! Hello everyone and welcome to my little corner of the crafting world! I hope your Monday is treating you well. It's always tough for me to get back into the swing of things after the weekend. But, I've got the laundry going, the house straightened up (somewhat), supper planned and now I'm ready for some "me time"! Today's card was created for this month's Feel The Love Project that Madison hosts over at Funky Cards. This month she is collecting birthday cards and decorations for an organization known as "Sheffield Place" - a home for homeless Mothers and their children. You can read more about this wonderful organization over at Madison's blog. Isn't she just the cutest little Birthday Fairy? * Bright, happy papers are from the "Uptown Flair" paper stack by "The Paper Studio"
*Mat is created with Spellbinders die "Lacy Ovals"
*Sentiment mat is from Spellbinders also - "Ribbon Banners"
* Fairy and sentiment are from the June Stamp set by "Peachy Keen Stamps"
* I used my Copic markers to color the Fairy - still learning here, but having fun! Ok, guess it's time to go finish up the laundry and maybe clean a bathroom or two (blah). I hope you have a wonderful Monday and I'll be talking with you soon! Those green flowers are just amazing!! Love it...happy Monday to you! Oh this is just too cute! Love it! This is way cute!! So bright and happy!! Oh my goodness yes! She is the cutest fairy Tanya!! One little girl will be so excited to get this card:) Thank you so much for all your support!!! You ROCK!! A-dor-able!! How did you get the two colors on the spellbinders ribbon die? Cut in white and inked the raised part in pink? Ingenious! Let me know. Thanks!--Pat N.
How sweet. Love the cute fairy, the paper. And the flower ribbon is perfect! Great card! Pink and green, love it! Adorable, really love this card, very cute!! Tanya, this is adorable. She's so bright and cheerful. I love those green ribbon flowers. Too cute! She IS one of the cutest fairies!Love your card and colours. Oh my goodness, this is adorable!! 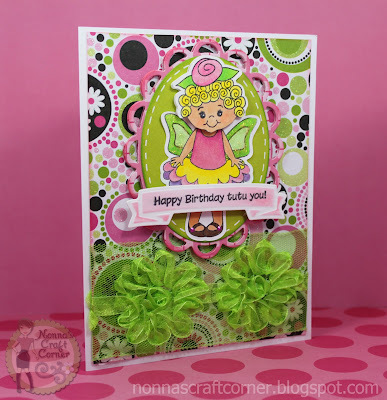 The colors are so bright and such a cute little fairy!! Love this!!!! SOOOO CUTE! 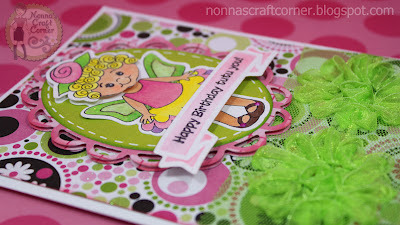 I LOVE that paper and the fun colors and that adorable fairy... Can ya tell I Like this card! :o) Wayy to CUTE!!!! Look at those amazing colors! It's awesome!! !